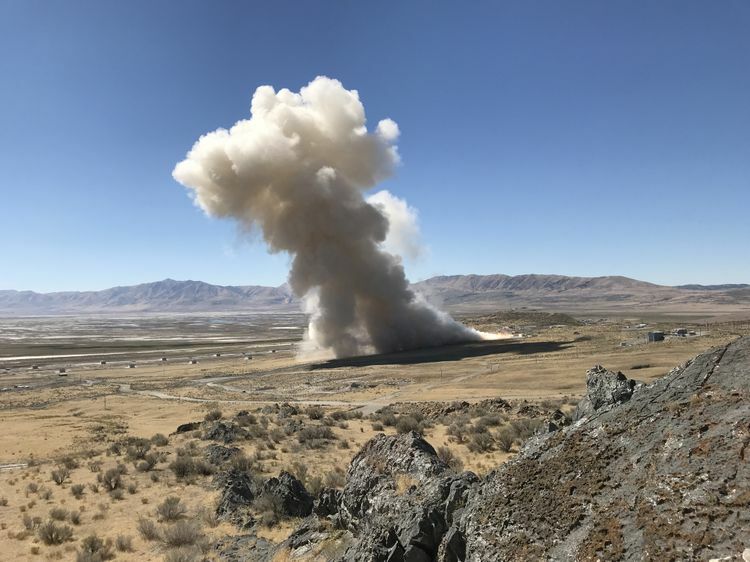 September 21, 2018 – Northrop Grumman Corporation conducted its first ground test of a 63-inch diameter Graphite Epoxy Motor (GEM 63) on Thursday in Promontory, Utah. Utilizing advanced technologies, the company developed this new rocket motor for use on the United Launch Alliance (ULA) Atlas V launch vehicle. Northrop Grumman began developing the motor just three years ago, reaching this static test milestone in rapid time for such a complex drop-in solution to an existing launch vehicle. The team developed the innovative design that tailors motor performance to meet ULA design objectives under a cooperative development program. The GEM 63 motor will be used as a direct replacement of the previous strap-on boosters on ULA’s Atlas V rocket beginning in July 2019 with the Space Test Program (STP)-3 mission that will use five boosters. Additional missions will follow, each of which may include up to five solid rocket motors. The relationship with ULA began in 1964 when Thiokol (a Northrop Grumman predecessor company), in Huntsville, Alabama, provided three CASTOR® I strap-on rocket motors for the Delta D rocket. Several years later, CASTOR IIs flew on the Delta E rocket, and subsequently CASTOR IVs helped launch higher-performing Delta rockets. Also, CASTOR IVAs flew on the Atlas IIAS vehicle from 1993 to 2004, when 120 solid rocket boosters flew on 30 successful Atlas IIAS launches. Prior to the current Delta IV heavy launch vehicle, Northrop Grumman provided the large three-segmented Solid Rocket Motor Upgrade (SRMU) strap-on booster for the Titan IVB rocket. Thirty four SRMUs successfully flew on Titan IV from 1997 to 2005. Northrop Grumman, then Hercules, began developing the GEM family of strap-on motors in the late 1980s with the GEM 40, 1,003 of which have subsequently flown on 132 successful Delta II launches. The company also developed the GEM 46, 54 of which flew on six successful Delta II-Heavy launches. Northrop Grumman later developed the GEM 60, and to date 62 of these motors have flown on 25 successful Delta IV launches. The company’s family of GEM 63 rocket motors builds on this extensive flight history. Both versions of the GEM 63 family use common materials and processes to maintain a high-reliability, low-cost product. The next GEM 63 motor test, scheduled for November, will satisfy additional requirements for certification by the U.S. Air Force.